The largest and most important catfish to sport fishermen in Montana is the native channel catfish of the Yellowstone and Missouri River drainages. These fish prefer warm, muddy rivers and lakes where they forage on just about any animal and some plants, living or dead. They are excellent eaters and millions of pounds of channel catfish are raised commercially in southern states for that purpose. Like all catfish, channel cats spawn in the spring or early summer. The female lays her jelly-like mass of eggs in a nesting site in a dark, protected cavity such as a muskrat burrow, under a stump, etc. and the male guards the nest until the eggs hatch. Biologists have captured channel catfish over 30 pounds in Montana but 2 to 4 pound fish are more common and better eating. The deeply-forked tail separates the channel catfish from the bullheads. 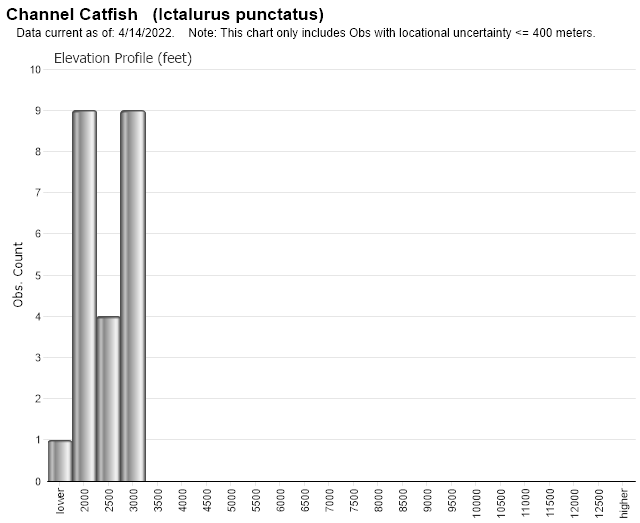 Other Montana catfishes do not have a deeply forked tail. May migrate considerable distances to spawn in tributary streams. Prefers large rivers and lowland lakes. Thrives at water temperatures above 70 degrees. Tolerates turbid water. Omnivorous feeder. Uses almost any living or dead organisms available. Small tributary streams may be vital for reproduction in the lower Yellowstone system. Sexually mature in 3 years. Spawns May-July after water temperature exceeds 75 degrees F. Incubation: 6-10 days. Spawned late May-mid.Aug. in middle Missouri River study with peak in July. Spawns 66 degrees F. Marias River. 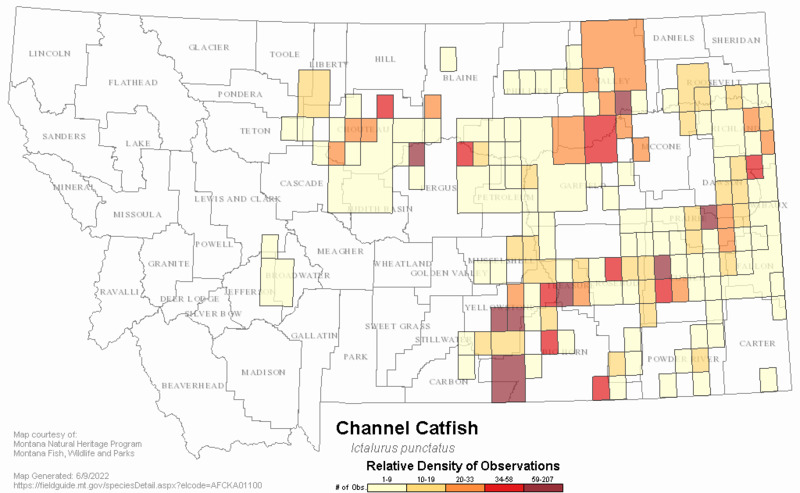 Web Search Engines for Articles on "Channel Catfish"